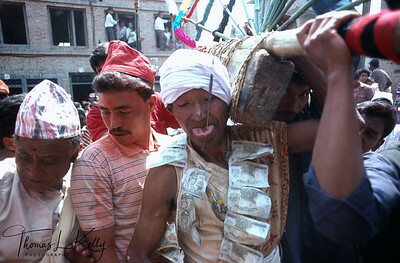 Across the highway from Thimi is the village of Bode, which has its own new year procession and another ceremony, a tongue boring at the temple of the Goddess Mahalaxmi (Goddess of wealth). 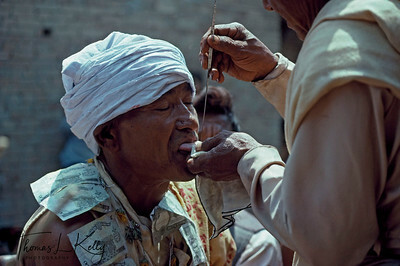 A volunteer, who has a undergone a four-day cleansing ceremony, offers himself to the temple, pujari (priest), who holds the man’s extended tongue with a piece of cloth. The priest thrusts a long, spikelike needle through the penitent’s tongue, and the man walks about the village so that all may witness the penance. Bleeding is considered an ill omen; a bloodless penance is seen as evidence of great merit. 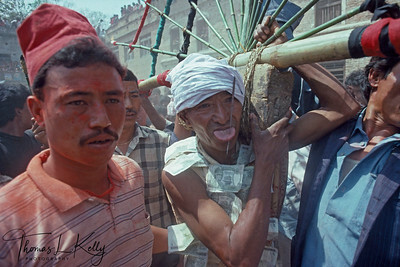 In Bode village, every New Year a man volunteers to fast twenty-four hours then stand on the stage to have his tounge bored with a thin steel spike. He walks through the village, the spike in place, and carries around disk like trellis, with flaming torches along the rim. In return for such a performance, it is believed, the man will go straight to Heaven when he dies. Kathmandu, Nepal.